When football fan Gavin Croft decided to spend some of his individual budget on a Rochdale FC season ticket for a friend to accompany him to matches, he could never have imagined it was a choice that would generate so much interest. But that was back in 2006 when individual budgets were being piloted by Croft's local authority, Oldham Council, one of 13 across England trialling the system, which integrates several funding streams. Some raised their eyebrows at the time but many more, including the then care services minister Ivan Lewis, celebrated Croft's use of the cash as imaginative. Since then Croft, who has multiple sclerosis, has come to symbolise the twin aims of individual budgets: independence and choice. Along with personal budgets and direct payments, individual budgets are at the heart of the government's vision to create personalised adult social care. And Croft's example proves that when it comes to individual budgets almost anything goes - as longas it's legal. Up and down the country there are many others,including people with learning disabilities, who are using theirbudgets in imaginative and sometimes unconventional ways to improve their lives. Ronnie Brindle and Hannah Lewis are among them. 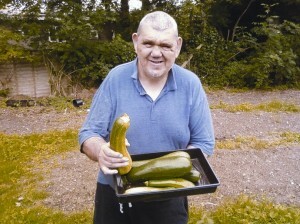 Ronnie Brindle, who lives in Hertfordshire, has used money from hisindividual budget to cultivate an allotment. He grows and sellsvegetables. "I spend money on seeds, compost, manure and I growvegetables - loads of them. Courgettes, runner beans, potatoes,beetroot, tomatoes and sprouts are some I grow. "I only startedplanting last February and I sold vegetables to staff at the placewhere I live, and a market. I didn't make that much, about £30, butit was my first year and this year I am going to see if I can get acontract with the council, maybe for a day centre. "I go to theallotment about twice a week. I've got asthma and diabetes so Ican't go all the time, but I like going because I'm out and aboutand I get fresh air. "I used to work at a nursery and I learned howto grow plants when I was there. My social worker Becky thought anallotment would be good so I had to go to a meeting at the counciland it had to be agreed. "I use my budget to buy the things I needand then I have to keep the receipts. If you don't keep thereceipts you have to pay the money back. You can't just spend it onanything. I don't see it as a job but as a hobby and I really enjoyit." Steve Johnson, an activity support worker with theorganisation Out and About is employed by Ronnie for six hours aweek to help him on the allotment. Steve says: "When we firststarted the plot was very run down and I was a bit worried thatbecause it's in the middle of a housing estate it would getvandalised. But that's not happened and we've now got it lookinggood. Ronnie was given one plot by the council and now they'vegiven him the one next to it too, so he can plant more. "We had towork hard to prepare the allotment. Ronnie is a bit unsteady on hisfeet so we've put down stuff called Roll-a-Path because you're notallowed to lay concrete. We've also got a shed so we can stop andhave a cuppa in there. We are now doing some research into whetherwe can sell some vegetables to day centres. Ronnie wants to takeorders so he knows what to plant. "It is hard work but if there'ssomething bothering Ronnie, gardening helps. When it comes toharvesting he's so happy with the results. Without the allotment wewouldn't see such a happy Ronnie." Hannah Lewis, 23, lives with her family in Essex. She has Angelman syndrome and has no speech. The family decided to spend some of Hannah's individual budget on a Mongolian yurt, a wood-latticed portable dwelling traditionally used in central Asia. The yurt, which is 14-feet across, stands in the grounds of the Lewis's home. They run kennels and a cattery in five acres of Essex countryside. The yurt has a sofa bed for overnight stays, a television and a pot belly stove, which, along with the triple insulation, keeps it very warm in winter. A skylight makes it more airy in summer. More solid than a traditional tent, the yurt has adouble wooden door, but it nevertheless can be assembled in four hours and easily dismantled and moved elsewhere, which makes it very practical. Hannah's parents bought the £4,000 yurt using the individual budget in June 2008 from a company based in Cornwall. Her mother Gill explains: "We saw them on a documentary where a woman needed an extra bedroom for her daughter but couldn't extend her house. "It is fantastic for us. The main problem for me is that Hannah does not like to be away from me. By having the yurt we are slowly encouraging her to be a bit independent from me and that'sgood because there will be a time when I'm not here. "She'll stay in the yurt with [her sister] Chrissi or sometimes carers. They spend a couple of evenings a week in there, watch DVDs, eatchocolate, the usual stuff. The yurt has really helped Hannahbecome more independent and she will now go off and do things withother people." Weekends away with her sister and friends are nowpart of Hannah's life, says Gill, adding that she is also happy tospend more time with her carers, which means she is out and aboutfrom 9am-4pm every weekday doing courses, visiting leisure centresor socialising. In the past, evenings could be difficult. "Hannah would want me all to herself so she'd kick her brother until he gotannoyed and went to his room, her Dad would end up in another roomon his computer and Chrissi would be elsewhere. Everyone would beforced out and then she'd lie across me on the sofa." Having theyurt has benefited the whole family. "It has become the differencebetween coping and not coping. Hannah has somewhere to go that sheenjoys. She hated going into respite care and when she came outshe'd be very angry with us for a week," says Gill. She loves theyurt as it is next to our barbeque area and she'll spend time therewith Chrissi and Ben and their friends and be part of things. Ourlives are a 100% better because of the individual budget. Before,we found that care was constantly being taken away from Hannah because her needs did not fit neatly into a category. She was tooable for some things and not able enough for others. I was very keen not to be a mum taking over so I consulted the whole family onwhat they thought Hannah would like. I'm sure the responsibility oftaking charge of what is a large budget would scare the livingdaylights out of some people, but I think I've been benefited bythe fact I run my own business and I'm used to spreadsheets. I'vefound the process enriching. So often before we just copedday-to-day, but now with the individual budget we can really planfor Hannah."